with a song list, and (for me) a punk song list made it even better. Battle of the Bands (filling in for Patty, who broke her arm the week before). intent is still there and will always be for anyone willing to listen to the old songs. Bouncers (willows) were Jenniforensic, Bob, and Matt. Kitchen witch was Norma. Procession: Lining up and getting hand-stamped at the door. Opening Chimes: Two trash can lids, banged together three times. everything that is, lend us your presence." Brief discussion of ritual and holiday. Energy-raising popcorn throwing and slamdancing. and from whence do those waters come? and how do we honor this gift of life? and has she given forth of Her bounty? school, He had dark curly hair, a very cool fedora-like hat, and a wonderfully devious smirk. God has remained with me. on our way to the show. themes for certain rituals, Lughnasadh included. 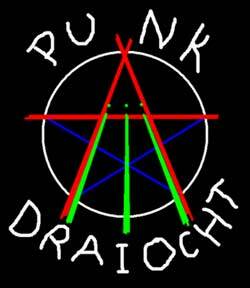 Why not have a punk rock Lughnasadh?